Going away for the winter to a warmer location? Taking a break from hot tubbing in the winter? Whatever your reasons, if you are not going to be around to take care of your hot tub or don’t plan on using it during the winter, then it’s best to learn how to winterize a hot tub properly. You can hire a professional to do this for you, or you can do it yourself. At Swim University, we like to do things ourselves. Make sure there is absolutely no power getting to your hot tub. Using a sump pump or the drain plug, begin draining your hot tub completely. If you decide to use a sump pump, make sure when you’re finished to remove the drain plug from your hot tub anyway. If you use the drain plug, some hot tubs will allow you to attach a garden hose to it. I would recommend using a sump pump instead of the drain because the pump works much faster. You’ll know what I mean if you try to use just the drain. 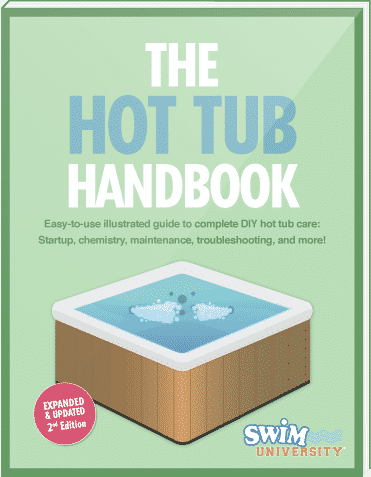 Check to see if your hot tub has an air blower. If it does, then you should get the remaining water out of it. To do this, turn off the heater – this will prevent the heater from being damaged when you turn the hot tub electric back on (the heater element should never run without water). Put the cover back on the hot tub and turn on the electric – this will run the air blower. Let it run for about 30 seconds, then shut the power off to your hot tub. It would also be a good idea to completely unplug the tub if it’s not hard-wired. Take the cover off your tub and remove all the filters from inside your filter well. At this time, it’s a good idea to clean them with filter cartridge cleaner. You don’t want to store away dirty filters. I recommended doing a 24-hour chemical soak to clean the filters for the winter. Make sure that the filter well has no water in it. You can use a shop vac or a sponge to help get all the water out. Open up the cabinet to your hot tub and locate the pump or pumps. If there are unions that attached the PVC pipe to the pump(s), loosen them. Remove all the drain plugs from the pump(s) as well. This will allow water to drain from your pipes if condensation builds up inside. Make sure to keep the drain plugs in a safe place that you’ll remember. Take a shop-vac and turn the setting to blow, or whatever will force air out instead of suction. Get in your empty hot tub and place the shop-vac hose up to all your jets. Work your way around the entire hot tub until you’ve blown out every single jet. For good measure, repeat this process. Now that you’ve blown out the pipes, you are going to have some more water in the tub. Make sure you get all the water out of the tub by using a sump pump, shop-vac, or a sponge. You don’t want any leftover water in the tub. Make it completely dry. Now that you have an empty hot tub, I recommend you give it a good cleaning with some hot tub cleaner. If the cleaner you use requires you to rinse with water, just make sure you remove that water before completely closing it. Also, clean the cover by using a hot tub cover cleaner on both the outside and inside. It’s important that you secure the cover to your hot tub by using the straps. If your hot tub cover will lock to your tub, then I suggest doing so. You don’t want anyone or anything getting inside the hot tub. You also want to protect your hot tub from blowing off in severe winds. You have successfully winterized your hot tub. It’s a shame you won’t be using during the winter, which I believe is the best time to use a hot tub. Have you ever soaked during a snow shower? It’s mind-blowingly relaxing! Whether you want to use your hot tub during the winter or close it, there are several steps you need to take to protect your hot tub during the winter.